This past week, we have had the Illegal Wildlife Trade (IWT, 2018) conference in London. The third party reports seen from attendees at IWT 2018 reinforces the message that for any given persecuted species, such as the African elephant, every life is precious – as elephants are slaughtered daily by illegal poachers seeking to cash in on the seemingly insatiable Asian demand for ivory. 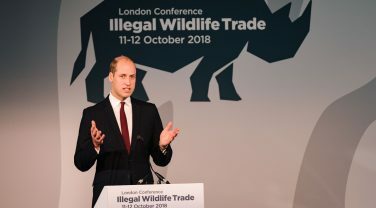 The Duke of Cambridge (Prince William) announced at IWT the convening of the Wildlife Financial Taskforce, as a new element in the Duke’s United for Wildlife fight against wildlife trafficking. The new taskforce’s objective is to help identify, trace and combat the illicit funds garnered from illegal wildlife trafficking, filtered and laundered through legitimate financial mechanisms. However, the sheer contradiction, dichotomy and confusion with regard to the conservation of a threatened species, such as elephants was apparent when it was reported today that the “Duke of Cambridge backs trophy hunting in Botswana, says president” (Ben Webster, The Times, 13 October 2018). How can the Duke of Cambridge on the one hand decry the illicit slaughter of elephants by poachers and criminal syndicates to profit from ivory, but on the other hand allegedly endorse the mooted potential slaughter/culling of elephant families by hunters for trophies in Bostwana? Of course the former is illegal, the latter ‘legal’ – so what’s the problem? Upon reviewing Ben Webster’s one-on-one interview at IWT 2018 with His Excellency the President Mokgweetsi EK Masisi of Botswana, the confusion/paradox is transparent. For these reasons, President Masisi says the elephants that are off the reservations need a “diverse strategy” to manage and mitigate the escalating conflict for the ‘benefit’ of all concerned. So, there is undoubtedly a problem, but where is the joined up thinking regarding the elephant species on a continent wide basis? At this point, the interviewer, Ben Webster (The Times, Environment Editor) started comparing such an elephant cull/kill approach to the United Kingdom’s ‘issues’ with badgers – whereby Ben Webster asserted that badgers were carrying a disease (tuberculosis (tb)) and infecting UK farmers’ cattle – however, Ben Webster seemed to gloss over the lack of supporting science for the mass, random culling of badgers as an effective solution (the mass inoculation/vaccination of badgers (and cattle when a vaccination materialise) against tb, plus more restricted transfers of cattle being a more humane and potentially cost effective solution of course). Surely, if the idea of conservation is to save the elephant species as a whole, then macro management by the hunting/killing of elephants as a convenience does not fit within any continent wide strategy/vision for conservation. President Masisi has stated that the people of Botswana will decide the fate of the ‘success’ of Botswana attracting too many migratory elephants – but it begs the question, if the elephants are migratory, why should Botswana alone decide (and fund potential solutions) the fate of the migratory elephants that have sought refuge on Botswana’s soil? There needs to be wider support [ie. from the Elephant Protection Initiative (EPI), of which Botswana is a key/founding member] to help solve the problems the elephants are causing, for the safety of Botswana’s population and for the African elephant species. The EPI reported October 2018 that Botswana is yet to submit its NEAP. Surely, Botswana’s proposed potential killing of elephants as a convenience (even under the guise of ‘legal’ trophy hunting) is hard to accommodate within the EPI’s conservation strategy without the EPI being undermined – or will the “sacrifice of some, to save the many” excuse* be used yet again? * The African Wildlife Foundation reported in October 2017 (after intensive analysis of the CITES trade database) that between 2001 and 2015, an estimated 81,572 African elephants were killed for hunting trophies – which equates to around some $2bn in trophy hunting income, at 81,572 x $25,000 (estimated average) per trophy. Where are the past ‘elephant conservation funds’ so raised and why can’t these ‘conservation’ funds raised from trophy hunting (as claimed by its advocates) be made available to the EPI? However, one other lesson from IWT this week has been the back-lash against the Duke of Cambridge’s alleged ‘White Saviour’ mentality. Clearly the most important thing is to actually care in the first place, regardless of one’s skin colour – but the message and the intent/objective of that caring has to be consistent, clear and all encompassing too. President Masisi also alluded in his interview with The Times to the ‘tree huggers’ mentality,’ not understanding Africa and not having to face “marauding” elephants in their daily lives, but somehow feeling their opinion should have weight – he means people such as myself I suppose! Again, perhaps it’s because people care (which is better than not caring isn’t it?) that they feel the need to express their views – also something to do with freedom of speech I believe. However, at the same time it’s hard to see how proposing to execute elephant families as a convenient solution to a macro problem (whilst potentially not giving due weight to the bigger picture of the need to conserve every elephant life whilst the species is under unrelenting threat), seems to ignore the image President Masisi wants to promote of Botswana as an ‘Eden’ for tourists – an image which also needs to resonate with potential visitors, such as myself I would suggest. So, I hope President Masisi and the people of Botswana consider how the proposal to execute ‘problem’ elephant families by taking dollars from trophy hunters clashes with that ‘garden of Eden’ (sic) image/appeal – consider if other options within the “diverse strategy” offer better longer term dividends and help preserve the image of Brand Botswana as a safe haven for wildlife, no matter the difficulties and the effort needed to do the right thing, not just the easy thing. I am sure, the Duke of Cambridge would agree that the effort and support needed to translocate elephants is a far better option than the outdated convenience of killing elephants and pretending it’s somehow part of the bigger conservation picture – if not, then President Masisi is right, I do not understand. 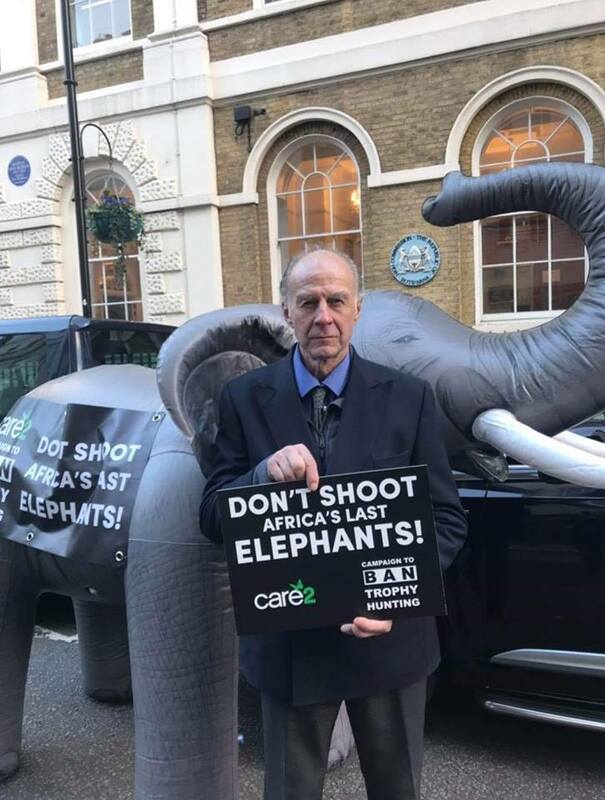 “Sir Ranulph Fiennes, Bill Oddie and other celebrities and campaigners today called for Botswana to cancel plans to allow trophy hunting of elephants to be legalised,” 29 October 2018.